The XK has all the characteristics of a great gran tourer, but in XKR form it might as well be discribed as a true muscle car. 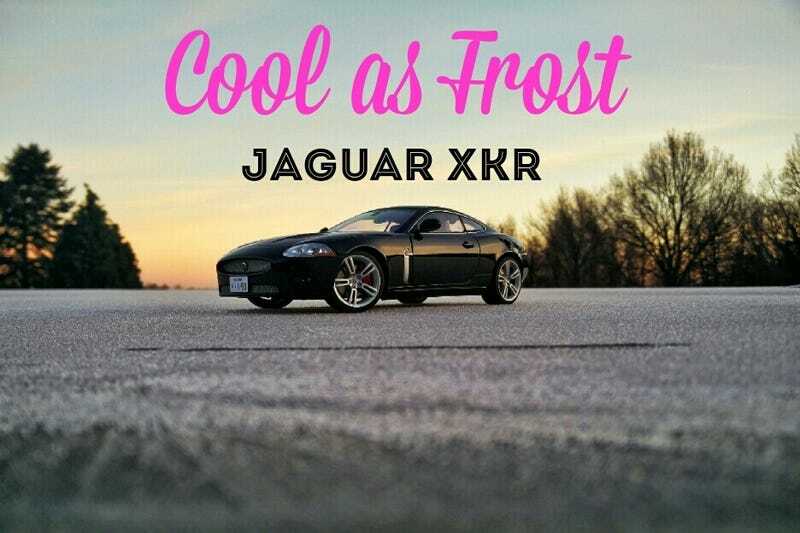 The car in the pictures is a 2006 XKR with a 4.2L Supercharged V8, producing 420 bhp and 560 Nm torque. With the 2009 facelift the XKR got a 5.0L V8 Supercharged V8 producing 510 Bhp and 625 Nm torque. Thanks to these powerfull engines, the extensive use of aluminum and the aerodynamic design these Jag’s performed pretty well. The internal chassis code of this generation XK’s is ‘X150'. The ultimate version of the X150 chassis was the XKR-S-GT, a USDM-only track-oriented monster, limited to 30 vehicles. The current F-Type has an improved and shortend version of this X150 chassis. This car is my 1:18 XKR by Autoart. I took it outside for a little photoshoot in the morningfrost. It is right hand drive, painted in Midnight Black with a cream interior and red brake calipers. I ‘modified’ it with a ‘Speedhunters’ sticker on the underside of the bonnet and a selfmade Japanese numberplate. The numberplate refers to the chassis code, ‘X150'. I chose a japanese plate because in my opinion Japan has the coolest car culture in the world and this way I can dream of driving my Jag on the legendary Wangan highway and of parking it at Daikoku and Tatsumi PA.